The Wests Tigers will hope to continue their unbeaten run to start the season, while the Brisbane Broncos will look to register their second straight win. Join The Roar for live scores and a blog, starting from 8:05pm (AEDT). 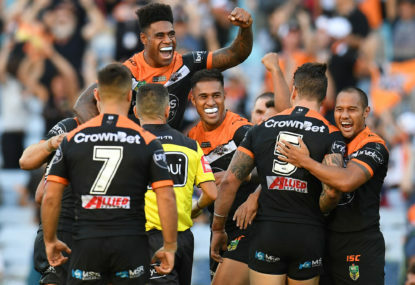 The Tigers can be said to have been lucky in the first two rounds of the season, as can the Broncos last week, racking up their first win of the season against the Cowboys 24-20. Brisbane came off second best against the Dragons in round one, losing 34-12, while the Tigers have defeated two of the title favourites, in the Roosters and Storm 10-8. In team news, Jack Bird is expected to make his debut for Brisbane. He is one of three changes, with Jaydn Su’A joining the bench, Jordan Kahu leaving the side with a broken jaw and Tom Opacic moving to starting centre. For the Tigers, Tuimoala Lolohea isn’t yet back from injury, thus Corey Thompson and David Nofoaluma retain their spots, while, in the forwards, Elijah Taylor is ruled out with Matt Eisenhuth in at lock. Keep an eye on the goal kicking, which has largely impacted the teams so far. The Wests Tigers have kicked 12 of their 20 points over the first couple of rounds, and the Broncos got home last week against the Cowboys, due mostly to good kicking. Join The Roar for live scores and a blog starting from 8:05pm (AEDT).